It is no coincidence that the period that witnessed the invention of the term was also the moment at which Europe was most aggressively asserting its imperial dominance across the globe. In recent years, alternative approaches to the Renaissance from history, economics, and anthropology have complicated this picture, and offered alternative factors crucial to understanding the Renaissance, but which were dismissed by 19th-century thinkers like Michelet and Burckhardt as irrelevant. This chapter situates the Renaissance within the wider international world. It argues that trade, finance, commodities, patronage, imperial conflict, and the exchange with different cultures were all key elements of the Renaissance. Focusing on these issues offers a different understanding of what shaped the Renaissance. It also leads us to think of the creativity of the Renaissance as not confined to painting, writing, sculpture, and architecture. Other artefacts such as ceramics, textiles, metalwork, and furniture also shaped people’s beliefs and attitudes, even though many of these objects have since been neglected, destroyed, or lost. That borrowed introduction basically sums up the one sided, exceptionalist definition of the first Global Renaissance, 400 years ago. Recent events suggest that the mistakes of the past are now undergoing a global rectification. The convolution of events for the last 9 years, i.e. between 2007 and 2016, have set the course for the world to correct itself, or more precisely, the mistakes committed by Western institutions and leaderships, to a more sustainable future free of wars, hunger and environmental destruction. The technology and political will to make this all happen are already in place in the East and are also in the process of being laid across the West. The various leaderships need only to just do it, and allow the birth of a truly multipolar world run its natural course from here on. There’s absolutely nothing to gain from throwing a monkey wrench along the way, except that of looking more unhinged to reality, e.g. Obama’s last minute anti-Russian sanctions and Washington Post’s US power grid hacking by the Russians, both of which suggest that George Soros, and therefore, Rothschild dynasty is in panic mode, and doesn’t really know how to respond properly right now. They are in panic because they could not launch any major false flag any more than a few assassinations here and there. Another 9/11 is much harder to pull off now that every intelligence agencies are working together at some level against the root of all wars and security threats against everybody. Death of political correctness and the rise of populist leaders are beginning to deal a death blow to the coat and tie warmongering criminals serving only the military industrial complex, BIS, Bank of England and Wall Street. 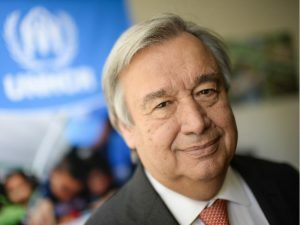 The election of a social justice and equality advocate, António Guterres, to the United Nations is expected to change the attitude of the body to be more responsive to global concerns rather being dictatorial in terms of governance policies, but without a real muscle to effect peace among its member countries. The newly installed UN Secretary-General Antonio Guterres issued his first address on Sunday where he appealed for peace in the world. “Peace must be our goal and our guide. All that we strive for as a human family – dignity and hope, progress and prosperity – depends on peace. But peace depends on us. I appeal to you all to join me in committing to peace, today and every day. It would be very impressive if the entire Palestine be returned to the Palestinians, and Ashkenazi Jews are allocated their own State in what is now known as the United States, perhaps. Arabian lands belong to the Arabs. The logic being that since the US government is consistently supporting Israel over and above the interests of the Palestinians, why can’t it allocate the same size of land within the US itself, to solve the Middle East conflict, once and for all. Realistically, if American citizens could allow the Israel lobby to exert so much influence on their government, a separate swath of land for the Jews should not be a burden. The Native Americans would still be forgiving, for as long as their established reservations, and the treaty they have signed with the Europeans, are fully respected. Immigrant America should showcase what it has been claiming itself to be, i.e. the beacon of freedom, beauty, and creativity amidst its own multi-cultural background. It would also be stupid to continue pursuing the Greater Israel plan when the death of fossil-based economies is already a foregone conclusion. In fact, Iran is already moving away from such oil dependency in a hurry. All of these measures are meant to correct the damage incurred during the Bush-Cheney’s war of terror, and earlier, which saw the significant deterioration of the global physical economy, especially that of the United States and EU, and the massive surveillance programs being initiated against both civilians and corporate competition around the globe, for the expanded and continuing enslavement of the masses. In simpler terms, this has been a massive Global Reformation that is paving the way for a Global Renaissance that is not just for discovering new technologies and methods, but more about implementing what is already there, hidden and exploited within multiple black projects that are still beyond public scrutiny. The death of the centralized corporate fake news mainstream media and the rise of the people-regulated alternative media will continue, as the former refuses to correct itself, but would rather persist in its self-destructing dissemination of patently false and unverified information. Soon, they will find themselves talking only to themselves alone in the darkness of their own creation. In the realm of East-West geopolitics, we don’t expect Trump to go to a shadow war with China, economically and kinetically. His anti-China rhetoric is just meant to increase the value of his bargaining chips against the Chinese. Even for a self-described shrewd Dealmaker, Trump can still be disarmed by the soft power being employed by Xi Jinping, i.e. a smart Dealmaker would never go to war with someone offering a bridge of friendship under a term that is already close to a dole out. The whole world needs to come to terms with an economically resurrected and modern China that has nothing else left to do other than to help others help themselves. One of the world’s longest high-speed railways has started operating in China, linking the country’s prosperous eastern coast to the less-developed southwest, the state Xinhua news agency has reported. The 2,264-kilometer Shanghai-Kunming rail line runs across the five provinces of Zhejiang, Jiangxi, Hunan, Guizhou and Yunnan. It cuts the travel time from Shanghai to the capital of Southwest China’s Yunnan province Kunming from 34 to 11 hours. According to train driver Wang Jinda, the trains can travel at speeds up to 330 kilometers per hour. In 2012, China started operating another high-speed link, the 2,298-km Beijing-Guangzhou line which stretches north to south. The country has more than 20,000 km of high-speed rail lines and expects to more than double that to 45,000 km by 2030. Beijing is also actively developing its own high-speed train technology. In the summer it set a new speed record with a train reaching 840 km per hour on a test run. Two trains were tested at the same time to prove the quality of Chinese technology. The trains, known as Golden Phoenix and Dolphin Blue zipped past each other with only 1.6 meters of space between them. China recently unveiled plans to build the world’s deepest and largest high-speed railway station as part of its preparations for hosting the 2022 Winter Olympics. The station will be constructed directly underneath Badaling – the most-visited section of the Great Wall of China, which attracts tens of thousands of visitors a day. The three-floor underground station will be located along the railway which is currently being built to connect the cities of Beijing and Zhangjiakou. The track will stretch 174km and is expected to be finished by 2019. China is also developing a new generation of trains capable of reaching speeds of 400 kilometers per hour for Russia’s Moscow-Kazan high-speed railway. Beijing plans to provide a $6 billion loan for the route which in future may become a part of a $100 billion high-speed railway connecting the two countries. As China completes its massive internal infrastructure projects, it has nothing else to do than spread its wealth around. It’s because the Chinese leadership has seen the folly of aiming for global control instead of allowing the organic growth of other economies. In practical terms, where’s the wisdom of manufacturing physical goods when there’s no one there who can afford them anymore? Economic and cultural exchanges will be the new normal that will shove away political intrigue and animosity among us. 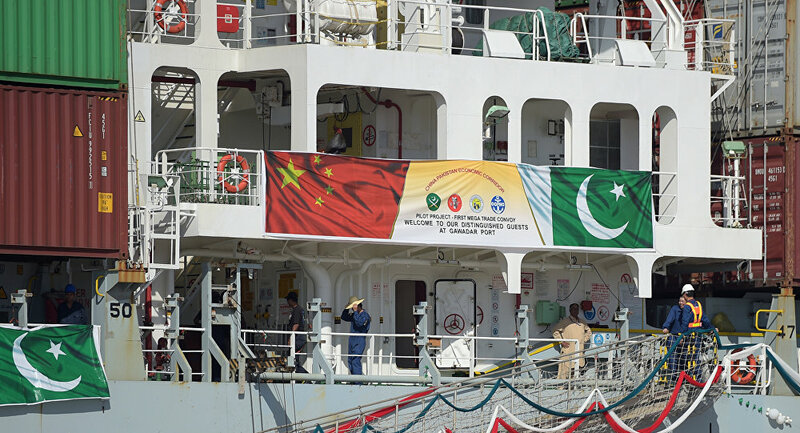 In this photograph taken on November 13, 2016, Pakistani personnel stand on a ship carrying containers at the Gwadar port, some 700 kms west of Karachi, during the opening ceremony of a pilot trade programme between Pakistan and China. China continues to invest in building close economic and trade cooperation with its Asian neighbors. In addition, Beijing is seeking to take control over infrastructure centers of the Asian economy, in a bid to become the regional economic leader. Pakistan thanked China for contributing to strengthening its national energy security. Pakistani Prime Minister Nawaz Sharif took part in a ceremony to launch the third block of the Chashma Nuclear Power Plant in Punjab. The facility was built with technological and financial assistance from China, according to the Pakistani newspaper Hindustan Times. One of the priorities of the Pakistani government is to end daily countrywide power cuts and to provide electricity supplies to each household, the prime minister said. The Pakistani government hopes to resolve the problem with the Chashma NPP by 2018. According to Sharif, the facility is a “concrete and outstanding example of constructive cooperation between China and Pakistan. The 340-megawatt energy block completed tests in early-October and was connected to the country’s energy grid on October 15. The NPP has four energy blocks, three of which are already operational. Sharif said that the fourth block will be launched with assistance from China in April 2017. Experts say that the Chashma NPP can be compared with another major economic initiative, the China-Pakistan Economic Corridor which is expected to be a transport, energy and trade bridge connecting northwest China to the Indian Ocean. Recently it was reported that China will invest $55 billion in the project, against the initial $46 billion. Acquisition by a Chinese consortium of a major stake in the Pakistani stock exchange will also add to the financial and investing presence of Chinese companies in the Pakistani market. The deal is estimated at $85 million. Among the participants are the Shanghai and Shenzhen stock exchanges. The Pakistani exchange was one of the best performers in the Asian stock market in 2016. The KSE 100 index, which shows performance of 100 major companies of Pakistan, rose over 40 percent this year. The deal between the Chinese exchanges and the Pakistani stock exchange is a breakthrough for Chinese companies in the Asian stock market. “This is an important indicator showing presence of Chinese capitals in global markets. Moreover, the situation in the Pakistani stock exchange is more stable than in the Chinese market. It is one of the most stable exchanges in Asia. This is why the Chinese consortium decided to buy a stake there,” Wang Zhiming, director at the Center for Globalization and Development of China, told Sputnik Chinese. Political ties between Pakistan and China have long been stable. Pakistan is also part of the Chinese government’s New Silk Road infrastructure project. “The Pakistani stock exchange is important both for Chinese companies and the Pakistani economy. The Silk Road means political contacts, infrastructure communications, trade without borders and exchange of capitals. Capitals need trade platforms and this is why China is interested in the Pakistani exchange,” Wang Zhiming explained. China’s involvement in an NPP in Pakistan, the China-Pakistan economic corridor and the deal with the Pakistani exchange are examples of Beijing taking control over key centers of the Asian economy, according to Mikhail Belyaev, an expert at the Stock Market and Management Institute. “This is an apparent trend, and China does not want to hide that. China is seeking to be the global leader, but especially the leader in the region. This is a pragmatic approach. Beijing begins with its neighboring countries where it is easier to establish control,” Belyaev told Sputnik Chinese. It is also important that China is building ties not only with such major regional players as Pakistan, but also with less important countries. “For example, China has launched construction of a railroad in Laos, as part of a trans-Asian railway. It is also interesting that China is trying to establish control not only over banks and companies, but also over infrastructure, including transportation and energy supplies. Thus, Beijing creates ground for its future financial and industrial leadership,” the expert pointed out. So, while the Western Oligarchy are busy building their alternate civilization off-world, the Eastern Alliance is busy making this planet even more livable, and if possible, a heaven for all who are here on terra. Directly or indirectly, everybody will be getting much of their fund from the asset-based Bank of China, one of the few non-Khazarian, non-Rothschild controlled entity. The Western financial cabal will have no other choice but to shift to a digitized fiat currency if only to continue the whole charade which put them in control from the very beginning. The ball is now with Trump, and what he needs to do is deliver the fundamental changes to the bureaucracy fast within the first 3 months, to deter any attempt at shortening his term of office. There’s a popular expert notion that he will run the United States much like a private company, i.e. lean and mean, or as efficient as possible, which should be good for America. Already, there’s a big possibility that he will be expending a significant amount of time undoing much of Obama’s regressive executive orders. However, we will be more impressed if he could release those long suppressed technologies, inspire American creativity one more time, and allow the growth of a truly hydrogen economy, at the very least. While it is true that there’s a possibility that the Old Word Order Khazarian Mafia can still hijack the smart system that are being gradually put in place, it is equally true that the sheer number of people waking up to what they’ve been doing won’t allow themselves to be controlled at all by AI-based machines. For example, while we knew from the onset that Facebook is a CIA personal information gathering mechanism, we are still using the same social network platform to spread our anti-establishment truths to defeat them instead. To put it simply, we can always overwhelm the system that they have put in place to work to our own advantage. The collective will of the awakened population still has the edge over the selfish few. However, the people in the West need to up the ante against the total exploitation of technology against their own privacy and economic survival, as the outgoing powers-that-be will continue to find ways to subjugate them. Certainly, we all have learned the dangers of ignorance and apathy. We cannot afford to lose all that we have gained so far, and we have gained so much already that wasting them all now borders on absolute insanity at the same level as the mindset which brought us nearest to our own extinction. Indeed, this Last Revolution needs to be perpetual and widespread as ever. Above all, savor the moment as the whole planet forces itself to lasting peace and harmony for all. Welcome to mankind’s own rebirth! One of the major sources of funds for the Nazionist Khazarian Mafia is the “healthcare” industry, which registered a whopping $3.09 trillion in 2014, and is projected to soar to $3.57 trillion in 2017, in the US alone.Help Us Defeat the Corrupt System by defunding the Medical Mafia supporting the fake news media networks, which promote terrorism and regime change around the world. Build your own Comprehensive Antiviral System, and start enjoying healthcare freedom today. The factors which will shape the coming decades are likely to be based on changing degrees in the momentum of processes already at work. Technological change in terms of 5G and Watson-like software developments will, some predict, have very rapid and profound economic and social influence. Once the templates have been developed which enable the monetization and organization of the already existing new technologies then there will be a relative explosion in terms of the pace of change. The real change relates to the leveling of the playing field globally. It is that which characterizes the past 120 to 40 years depending on how it is measured and it is likely to continue. Is this the 5G you are referring to? The evolution of human potential to cooperate and wisely transition out of darkness into a new era, needs to be nurtured by as many people as possible. I prefer notches in wood, skill-swapping, and bartering. One must expect the worst and hope for the best. If all you do is resist the lies and search for greater truth, you will be part of the solution. To believe the same old lies and to think that the status quo will lead to prosperity is insanity. As I stated here previously multiple times, Bitcoin is the answer. All this “Reset” and GCR/RV crap is a giant scam where the new boss is the same as the old boss. The so-called GCR is designed for THEM to stay in power by tricking you all into thinking they just “saved you” with a “new system” that is here to help you. Let the IMF flog their SDR who cares. Invest in yourself by exchanging that debt in your wallet for Bitcoin.